It’s becoming a well-known fact that the faucet of plastic production streaming since the 1950’s has been and still is, overflowing to pollute our oceans, lakes, and rivers with mass amounts of plastics. This stream of plastic reaches every corner of the globe from arctic seas to uninhabited islands to negatively impact ocean health, communities, and economies. The reach of plastics is huge, but so is the international effort by the Surfrider Foundation and ocean leaders to turn off the tap and prevent plastics from polluting waterways. So much so that plastic pollution was highlighted in all 6 areas of priority and all closing speeches, during the 4th International Our Ocean Conference held in Malta recently. Our Ocean Conference provides an opportunity for ocean advocates from governments, NGO’s, businesses, foundations, and research institutes to pledge commitments to improve the health of the ocean. This year’s conference achieved more than 400 commitments and over US$ 7 billion invested in positive ocean action from actors across 6 continents and 112 countries. 2017 commitme nts included 3 pledges from Surfrider Foundation Europe. Presented by Executive Director Florent Marcoux, commitments focus on awareness efforts to reduce single use plastic water bottles, effective management of marine litter, and the reduction of CO2 emissions in the shipping industry. #resetyourhabit aims to create awareness for individuals, industries, and the private and public sector on the impact of single-use plastic water bottles. It focuses on inspiring people to change their habits by encouraging the use of reusable gourds and canteens; industries to change the design of beverage bottles to high-capacity and refillable containers; private companies and public institutions to promote the use of tap water and water fountains. LIFE LEMA provides recommendations to local authorities to prevent floating marine litter from arriving on the shoreline. The initiative spans the border of France and Spain to encourage diversification of economic activities by fishermen through involving fishing and cleaning vessels in the removal of floating marine litter from the sea. Together they will contribute to the removal of 50 tons of floating marine litter in both France and Spain. The project is formed by an international working group that includes the Surfrider Foundation Europe, the Territorial Council of Guipúzcoa, AZTI Tecnalia, Rivages Pro, Tech Research Centers, the Syndicat mixte Kosta Garbia, and the municipality of Biarritz. LIFE LEMA will run until 2019 and entails a total investment of EUR 2.1 million co-financed by the European Union. 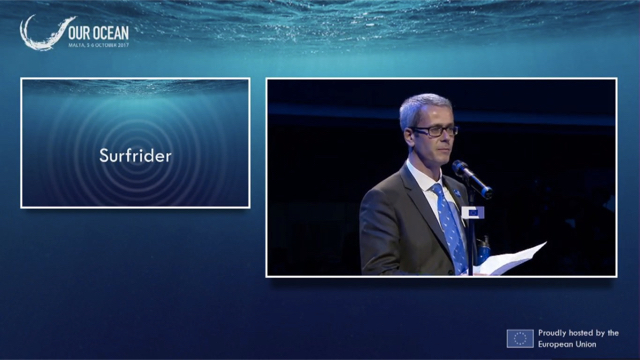 In partnership with ship-owners and key maritime stakeholders, Surfrider Foundation Europe will work to reduce shipping emissions through the promotion of a label for sustainable shipping. The label will aim at certifying that businesses have measured and reduced their CO2 emissions during the transport chain of their products - from the producer to the seller - and made this effort visible to consumers. The goal is to implement the label in France by 2025. Through cooperation with international chapters of Surfrider and the much larger world of marine conservation represented through the Our Ocean Conferences, we can make a real difference towards turning off the plastics tap and restoring the health of our ocean. For a full list of commitments pledged since 2014 at Our Ocean Conference check out the map!